The Cost Savings report provides a summary of possible AWS savings. 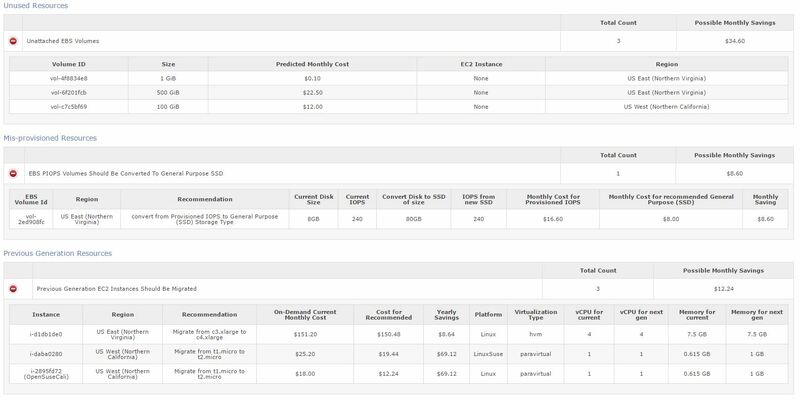 CloudCheckr uses information from our Best Practices Cost Checks to demonstrate the possible savings for your account. This portion of the report displays a concise total of expected savings available to your account. Alongside this total is a breakdown based on sub-totals from six areas reviewed by CloudCheckr. The lower portion of the report provides more detail about the Resources subtotals. Which Best Practice Checks Inform Each Category?